Prior to being injured Bobbie worked for years at her local Community College teaching adults with learning disabilities and brain injuries, and also for her local school district as a Home and Hospital Teacher. Bobbie was active in the Sierra Club, and for recreation she hiked almost every weekend in the local parks of Sonoma County and swam laps regularly at her local swim center. It was at the swim center where an acquaintance told Bobbie about a Rolfer she recommended. Thinking it would be like massage, Bobbie went to this Rolfer for a one time sample session. The treatment was brutal, injuring nerves and muscles in Bobbie’s neck and back and to Bobbie’s right shoulder blade and arm. Bobbie found herself living in chronic pain, unable to return to lap swimming and hiking. At the time of her injury, Ms. Jenke belonged to Kaiser, one of the largest HMOs in California. Kaiser failed to diagnose or treat Bobbie properly, and she spent thousands of dollars seeking outside care, which Kaiser refused to reimburse. 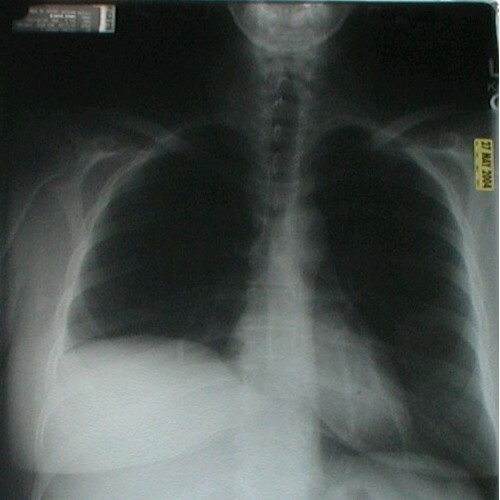 elevated diaphragm on right side. Taken May of 2004.